“A stitch in time saves nine”- when you resolve the problem immediately it may save undue efforts. By ignoring formal education one might still qualify as an event manager but ignoring cognitive skills might not qualify him as the best event manager.The event manager is swamped through unseen and unexpected problems during an event.But a good event manager has a tendency to recuperate any fragile event by applying his “Jugaad” tactics or ingenuity under any circumstances. The word “Jugaad” means a quick patch to any problem or issues, few like to call it as a“short-cut”. The word was less familiar to the world unless aSeminar in Chicago by PCMA on Frugal Innovative Approach for Events elicited its advantages. It emerged from India and now popular around the globe but with different names---- Brazilians call it gambiarra; the Chinese, zizhu chuangxin; and the Kenyans, jua kali and so on. With shrinking economy, “Jugaad” approach is getting better and better responses especially from countries having the higher growth economy. Coming out with a novel solution in adverse condition is the pedigree of human race and that's what describes ““Jugaad” the best.It pushes human intelligence to think out of the trend that sometimes appears witty and humorous but work quite effectively, especially when the source is scant or minimum to complete the task. When you swirl into the “Jugaadu” situation your reserve neurons get activated and tells you- “Hey there is no need of doing things in one way”. Soon your brain picks up the best solution to neutralize the issue. There is always a way out to encounter any problem, possibly the approaches may be different. For instance, 3+2 is also 5 and 4+1 is also 5. There are the countless epitome of “Jugaadu” work that you might have heard like - a solar based bicycle, an earthen-ware cooler or water purifier, a motorcycle operated water pump, ammonia and water based lamp, etc. Even you might have fixed numerous domestic crisis using the same approach like water dripping from faucet, broken specs frame, extending remote battery life, crossing-over a rainy puddle, with some basic skills and handful of local appliances. I guess this qualifies you as Jugaadians. There is no apprenticeship program or registered training to be a Jugaadian, this is something you nurture over time by observing and following your gut feeling with some blend of intelligence. Event Industry is huge and managing an event is a big task. Preparing yourself for last moment changes and solving unexpected issues in the event is not an event manager’s choice but a protocol. 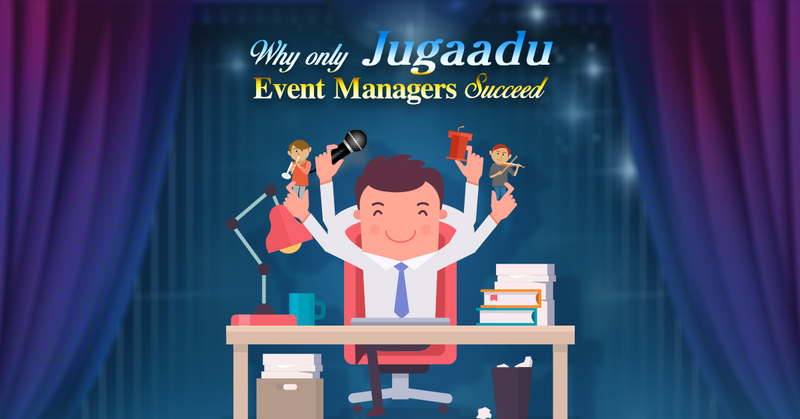 Below mentioned are few characteristics you must abide to be on the rim of successful event managers. There is a famous quote “out of adversity comes opportunity”. Tapping on favorable condition is not always going to happen in events. Sometimes capitalizing on the given situation is the ideal solution. For example, you have to hold an event in a ground having deep pot-hole, then you can probably use the pot-hole in your favour – maybe by creating a fountain around it or a smoking zone for attendees or even a campfire setting around it. Shoestring budget and meeting client expectation without compromising is often a scenario in Events.In such situation, adapting to frugal approach like replacing poster or banner with digital signage that can be reused again is more preferable than getting roasted on your limited resources.There is also a possibility that you are not using resources completely, by using it profoundly you can optimize the resource and can do more with less. To get away with Jugaads, you have to be proactive than reactive. It is just like a rapid fire round-- spontaneous and witty. During outdoor events if rain is not part of your backup plan then provide temporary sheds to guests where they quickly snug in and brag about the weather with the glass of champagne. If the event is on a small scale, then tapping and twining a foldable tent can be your anti-rain “Jugaad”. Jugaad work doesn't demand high technical arrangement but instead a simple design for time-being that meets the purpose. For instance in an event, if showcasing all the product manually at the same time is an issue, you can use a rotational stand instead. This should save your money spent on hiring another stall, at the same time it is easy to display the items. Jugaadu tricks so far were applied only to a domestic or at alower level but entrepreneurs Jugaad innovators have the broad perspective on it. They pulled it off as a mainstream business idea. To execute them it becomes necessary that you understand customers need and identify the product prospects from customer’s point of view. For example, a bicycle attached with a wheelchair could be a great value to give a park-ride to someone who is physically challenged or an aged person. For a good reason, we are gifted with a heart that is not just refrained to our body anatomy but referred to our emotional intelligence and basic instinct. Jugaad innovators have to take decisions not formerly based on research but what their customers feel about the product or their ideas. Jugaad Innovators are today’sThomasEdison and Nikola Tesla, their ideas can be a game-changer, where entrepreneurs can revive the squeezed economy by turning their ideas into business models. Let us know what “Jugaad” you know that stands for the best!